Ah, the eighties! Shoulder pads, big hair, bigger braces! Times and trends have changed, both in fashion and in dentistry. Gone are the days of walking into an uncomfortable waiting room with stacks of decade-old magazines and the sounds of drilling in the background. Today’s waiting rooms, by and large, are comfortable with music, televisions, and a welcoming face behind the desk there to help you. Scheduling options have improved with more offices offering expanded hours and online appointment scheduling. Reminders can be emailed to you or maybe you prefer a text message, helping you keep your busy day on track. Dentists today explain procedures to you as they go along, openly discuss treatment options, and use hi-tech equipment. And though the drills are still there, they are more precise and not nearly as noisy! Hygiene and safety are serious business at the dentist. You will see clean and sanitized and newly opened equipment in use. Staff are wearing gloves and masks for your protection and comfort and will ask you if you have any medical conditions they need to be aware of. Teamwork! Your dentist and dental team are there to help you. More than ever, you will notice that the dentist or hygienist is telling you what they are doing as they go along, taking away some of the fear of years gone by when you just laid in the chair and hoped for the best! They will explain every step as they go and make sure you are as comfortable as possible. For your benefit, be clear about any discomfort or issues you have been having prior to your examination. Dental insurance. Decades ago, many people did not have the option of obtaining dental insurance through their employer or on their own. With multiple options available now, the staff at the dentist is able to discuss what your procedure will cost in advance whenever possible so you will not be caught unaware. Many dentists will work with you if you don’t have insurance, and another popular option that did not used to exist is buying a dental care package directly through your dentist. This annual plan will include cleanings, x-rays, and discounted procedures. Extended office hours are becoming more common at dental offices around the country. 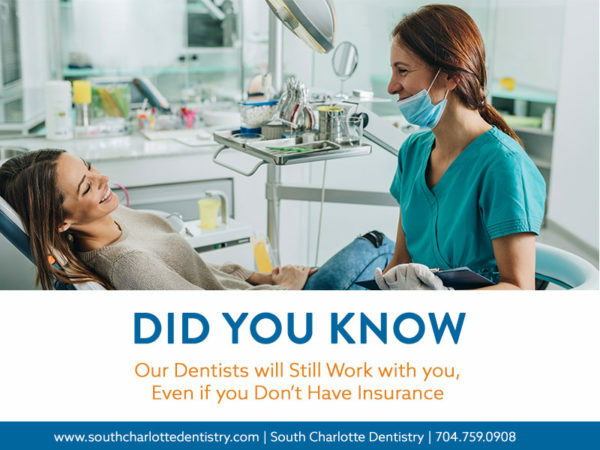 Knowing that many people have day jobs and limited flexibility, South Charlotte Dentistry opens at 7:30 a.m. Monday-Thursday so you can arrive at work with a smile! In many communities, there are emergency dental offices open in the evenings and weekends for those issues that just cannot wait. Advancements in X-rays. These aren’t your grandma’s X-rays! The first use of x-rays within dentistry, in the United States, took place in 1896. Advances in dentistry and the availability of the equipment grew and x-rays became part of the normal dental routine in the 1950s. 3-D imaging has become more popular as machines have become more advanced and more available in the medical community. Popular for ultrasounds, mammograms, and other uses, they are helping doctors and dentists better diagnose health issues, while making it easier on the patient. This truly is technology changing lives. A cavity’s best friend. Fillings used to appear silver and were in fact made of a combination of metals including: tin, zinc, copper, and silver. White fillings (a composite material) started becoming popular in the 1980s. The silver amalgam and white fillings are both still used in dental practices. So, what’s new? We now know that fillings, while strong, don’t last forever and advancements in X-rays and exam techniques will help discover issues much sooner. A brighter smile is now possible! A designer smile can now be yours! 30 or so years ago, you pretty much had to work with what you had. According to the ADA (American Dental Association), around 1990 there was a turning point with new tooth-colored restorative materials, plus increased usage of bleaching, veneers, and implants. Whitening of teeth was very rare until recent years. Before, it seemed like only movie stars and models had truly pearly whites. Today you can choose from whitening options including bleaching and whitening trays. Restorative dentistry has seen great advancements in the last twenty years. In the past, if you had a tooth removed, you learned to live with that gap in your mouth, or many gaps. Missing teeth can be unattractive, but missing teeth also make the remaining teeth work harder. 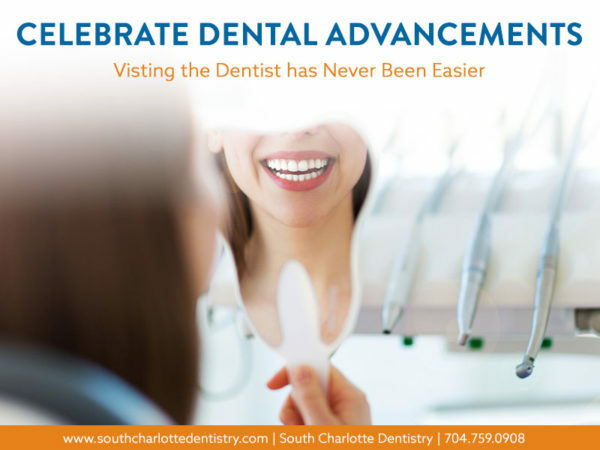 We provide restorative, or prosthodontic, dentistry at South Charlotte Dentistry. This process involves repairing or replacing bad teeth in order to restore the mouth. This can involve are multiple procedures, including using fillings, crowns, veneers, bridges, dental implants, and partial dentures. The main goal of restorative dentistry is to preserve the natural teeth as much as possible and to give you the smile you deserve. The use of dental implants, partial dentures, and other restorative tools is important if teeth must be removed. Braces used to be the first thing you noticed if someone had them and some kids just wanted to avoid having them altogether. Traditional braces caused sores, were tricky to keep clean, and restricted enjoying many favorite snacks. Having straighter teeth is beneficial for appearance, but also the health of your teeth. A popular option for youth and adults today is Invisilign Braces. Less invasive and more attractive, this modern approach utilizes a series of custom-made aligners. No gain from pain. Many people tended to only go the dentist when they were in pain, thus, the opportunity to prevent issues was often lost and going to the dentist became associated with discomfort and, for some, trauma. Getting into the habit of twice-yearly check-ups with cleanings will allow the dentist to look for problems in advance of you having to have a dental emergency. X-rays, oral exams, and cleanings will detect current and potential future problems. Most dental insurance plans cover much, if not all, of this cost and offer discounts on any additional procedures required. As Benjamin Franklin once said, “an ounce of prevention is worth a pound of cure.” Though he was actually referring to fire safety, it works for teeth too! Gum disease used to be something patients just “lived with.” Gum disease is generally not curable but it is treatable and more importantly, preventable. Prevent gum disease by seeing your dentist on a regular basis. Early stages can be treated with a dental hygiene therapy called scaling and root planning. Periodontitis, or gum disease, affects nearly half of all American adults, but at South Charlotte Dentistry, we have a two-step plan in place with dental scaling and root planning. While it might sound scary or like an outdoor adventure, the treatment is actually a deep cleaning measure that helps fight back against gum disease. This is a nonsurgical procedure to treat your teeth and gums against plaque, bacteria, and tartar deposits. Beyond the teeth. Checking for oral cancer is another recent addition to a routine dental check-up. Your dentist can examine your oral tissues easily by looking at your lips and inside your mouth, as well as, check your gingivae (gums) carefully, the inside of your cheeks, and your tongue (the sides and underneath). According to the Oral Cancer Foundation, approximately 53,000 people in the United States will be newly diagnosed with some form of oral cancer in 2019. Oral cancer, which includes cancers of the lips, tongue, cheeks, floor of the mouth, hard and soft palate, sinuses, and pharynx (throat), can be life threatening if not diagnosed and treated early. Relax, there are options. Many people fear going to the dentist and the potential pain of dental treatments. In the past, they had little options and would avoid getting badly needed dental work and even check-ups, but today there is I.V. sedation. Intravenous (I.V.) sedation has become more common and works well for those with fear of the dentist and dental procedures. It is also ideal for patients whose fear of dentistry has led to a large amount of dental work needing to be completed. I.V. Sedation is also used for outpatient procedures, like colonoscopies. Referred to as “twilight sleep,” you will wake with little or no memory of the procedure. Anesthesia is given via the I.V. and recovery requires someone take you to/from the procedure. Toothbrushes, flossing, and water piks, oh my! Advances in types of toothbrushes have made cleaning your teeth much more thorough and even fun! Gone is the “one size fits all” toothbrushes of 20-30 years ago. Now there are multiple sizes, types of bristles, easy to grip handles, and electronic versions on the market in all price ranges. Be sure to brush at least twice a day. Flossing is an important thing to do at least daily (after every meal is ideal) to remove plaque and excess food particles. Many types of floss are on the market now (vs. one type fits all 20 or so years ago). Flavored floss, flosser sticks (or picks), waxed and unwaxed string floss, dental tape, electric flossers, and natural floss are all available options. Water picks (the most commonly known one being manufactured by Waterpik) are water flossers that are handy for reaching those hard to get to teeth in the back. These come in a variety of price points and models, from table top to hand held. With all dental tools, check with your dentist about the best fit for you before making any purchases. Your oral health might contribute to various diseases and conditions, including: Endocarditis, Premature birth and low birth weight, Diabetes, HIV/AIDS, Osteoporosis, and Alzheimer’s disease. Even if you still have big hair, shoulder pads or drive your DeLorean to the office, the team here at South Charlotte Dentistry is ready to treat your dental health needs now, and into the future!